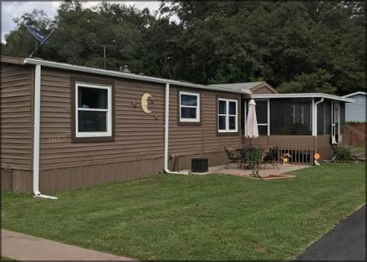 This is a beautiful 3/2 mobile on its own land, no Hoa fees. Well and new septic system. Updated Oak Kitchen with all appliances. Home has living room and a Family room, working wood fireplace that is open to family room and living room. Guest Bedroom and Living Room furniture is included. New A/C Heat unit. New septic and drain field. Newly painted inside and out. New paved driveway. New gutters. Master bath has walk in shower and garden tub. Tile and wood floors. New windows. Carport and two sheds. Covered screened deck with three patios. 1/4 acre totally fenced, Take advantage of this opportunity today!